Spektral is a dual 16 channel bandpass filter based spectral processor. You can morph between the two filters, the LFO, controlling the morphing is synced to Live. 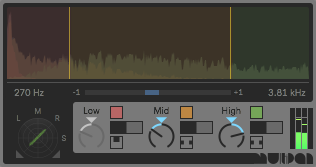 Morph is a dual morphing filter with dedicated LFOs for both filters and for morphing as well. The morph is not a simple crossfade between two filtered signals, but it is calculated in realtime. You can control the master mix (dry/wet) as well as the lovely mild/creamy tube/tape drive, to add more character, more vintage vibe. 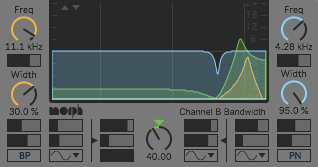 Mojo is a FIR (finite impulse response) based filter, designed to colour your tracks. ​The FIR filter convolves your signal with a IR samples recorded from an external device. In Mojo, you have built in IR types from vintage samples (E-mu and Akai) and tape. ​Also, there is a gen~ based tube drive and a bit reducer. As an extra addition, you can load your own files, recorded from your own gear or from third party suppliers. MultiPan is a three band, multiband panner, where you can pan (or convert to mono) your audio's three bands (low, mid and high) separately. You can set the low frequency (operates below that frequency) and the high frequency (operates above that frequency). The band between these two becomes mid. You can mute the bands and also, there is an extra gain control per band. Besides the controls, you have a phase scope, a correlation meter and a master meter, with indicators of clipping.